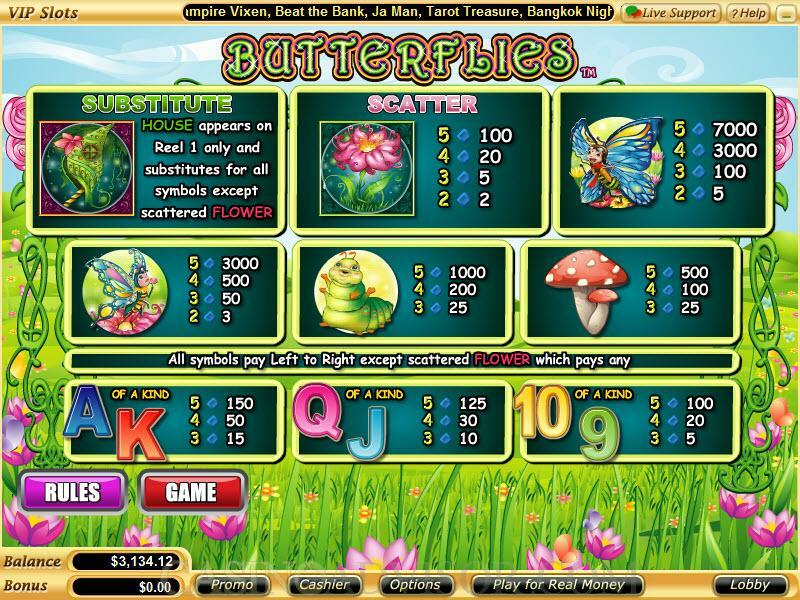 The theme of this slot game from Vegas Technology is butterflies. The reels are set in the background of green fields with colorful flowers and blue skies. The wild symbol is the House of the butterfly. It is the cocoon that is built when the caterpillar turns into a butterfly. The Flower is the scatter symbol. The main thematic symbols are the Male Butterfly, the Female Butterfly and a very cute looking Caterpillar. There is also a Toadstool. All symbols are done in caricature style. Colorful but simply crafted high card value symbols also grace the reels. The Male Butterfly offers the highest fixed jackpot of 7000 coins and the Female Butterfly offers the second highest fixed jackpot of 3000 coins. Only the wild and scatter symbols show animation. The Flower lights up and starts swaying. The animation in the wild symbol is not only excellent but appropriate. The House lights up and a beautiful butterfly emerges from it. This also triggers the Butterfly Feature. 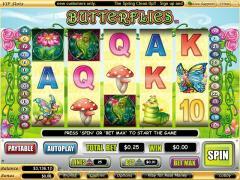 There is no background music in Butterflies slot game. However the usual game sounds have been incorporated. Players can manipulate the number of paylines and the coin size. These can be adjusted by operating the Up and Down arrows next to the respective buttons. All 25 paylines can be immediately enabled by clicking on the Bet Max Button. The coin size range is fantastic. Players can select from a number of options starting from 0.01 and going to 10.00. Since players can wager only one coin per payline, the line bet varies from 0.01 to 10.00. 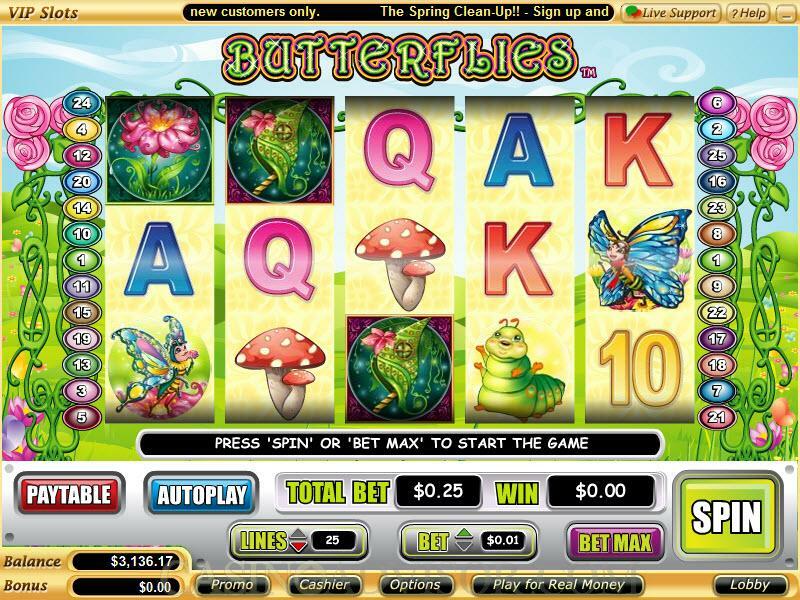 The maximum total bet per spin can go up to 250.00 and this will attract high rollers to the Butterflies slot game. The Flower is the scatter symbol. Two or more scatter symbols appearing anywhere on the reels offers scatter payouts, which are multiplied by the total bet per spin to convert to credits. The House is the wild symbol. It appears only on Reel 1. It does not offer any line payouts and does not multiply payouts. The Butterfly Feature is triggered when the House symbol appears anywhere on Reel 1. First the payouts, if any are credited to the player’s account. Then a butterfly emerges from the House and randomly lands on other symbols changing them into wild symbols. The additions payouts are then calculated and credited to the player’s account. This is the only bonus feature in this slot game. There is no free spins round or bonus game on the second screen. Also there is no gamble game. 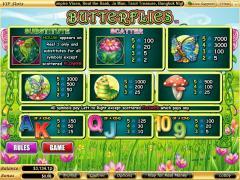 Butterflies has a very comprehensive Auto Play Feature. Players can select the number of spins from the option given in a drop down list. The range varies from 5 to 500. Players can also set the time between the auto spins from 0.25 seconds to 2.00 seconds. Players can also enable a number of Stop settings that automatically will terminate the Auto Play. These include stop if a win exceeds or equals a specified amount, or if the credits increase or decrease by a specified amount. The Auto Play feature can be terminated manually any time. Interested in reading more detailed information about Butterflies? If so Click Here for more details.